Since the discovery that RNA can be an enzyme, a fundamental question has emerged: How does an RNA molecule fold up into a precise three-dimensional structure capable of catalyzing a chemical reaction? 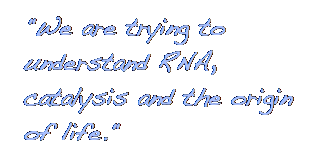 This problem is interesting not only from the point of view of living organisms, but also in terms of trying to understand how a pre-biotic "RNA World" populated by ribozymes, as evolutionary precursors of today's protein enzymes found in all living organisms, might have functioned. 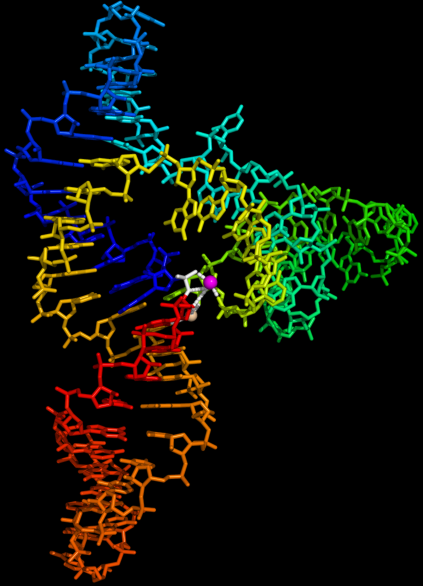 The first ribozyme structure to be elucidated was that of the hammerhead RNA, a small self-cleaving RNA. Currently we are attempting to understand the catalytic mechanism of this RNA, and to elucidate the structures of several other catalytic RNAs as well as various structural genomic and other non-coding RNAs. A recently published example is the crystal structure of the s2m RNA from the SARS virus 3’-UTR.